These days, I've been using the word epic with some regularity, there's just been so much good stuff going on! And today, I have something to share that is truly epic in the fun department. 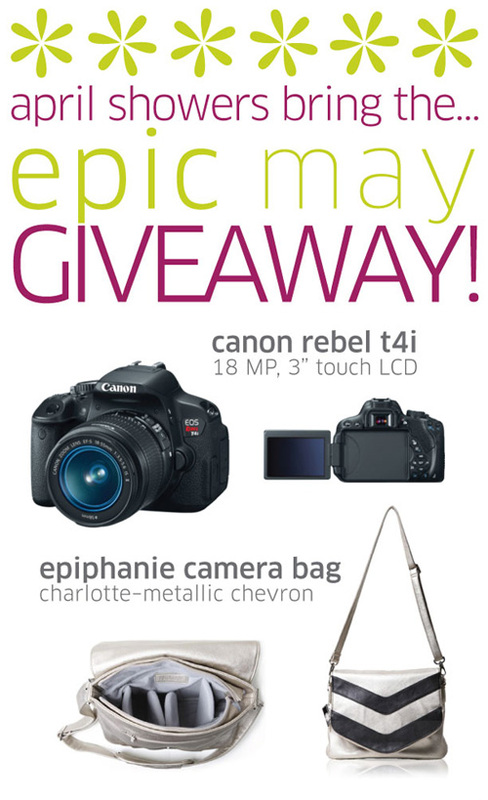 I'm teaming up with some wonderful bloggers to offer you an epic May giveaway including a Canon T4i DSLR + a gorgeous Epiphanie Charlotte chevron bag (I have been coveting this puppy), collectively worth ~$1055! Woo hoo! Enter to win between now and May 24, 2013 via the Rafflecopter widget below. Once the giveaway ends, the winner will be chosen randomly and contacted by email, with 48 hours to respond. Good luck y'all! This epic giveaway is sponsored by the ladies of Boston Mamas, Eat Blog Run, Make and Takes, Mom Generations, No Biggie, Petit Elefant, Pinterest You Are Drunk, Rage Against the Minivan, Rookie Moms, The Happiest Home, This Week for Dinner, and Todays Mama.